If you are looking for a high-quality enterprise service desk and IT asset management platform, we recommend that you look into Samanage, a very popular solution of this type. It offers powerful features that you can actually depend on. 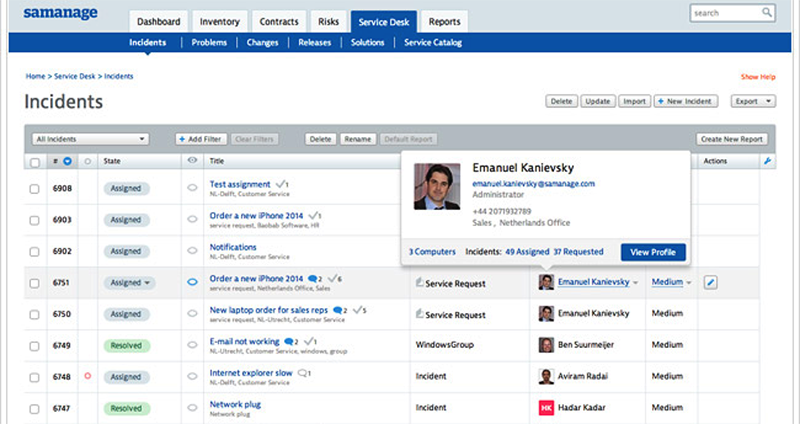 With its IT service desk, you can manage service and ticket requests, and provide a self-service portal with email integration. On the other hand, the self-service portal gives users the capability to resolve issues on their own while the IT asset management functionality helps you control and manage all assets across your company. In this article we’ll have a look at the most important Samanage pros and cons to give you a better idea of what the software offers and if it’s something your company can benefit from. Our SaaS experts at FinancesOnline have reviewed all popular apps in the customer software category and we were really impressed with Samanage’s features and benefits. The vendor offers flexible pricing plans that can be used by both small and medium-sized companies as well as large enterprises. There is also a useful free trial that can help you check out the app’s main features with no commitment involved. It gives you ample time to understand how the key functionalities work and how the software can help you boost your company’s productivity and bottom line. You can easily sign up for the Samanage free trial here. What are the features that make Samanage stand out as one of the top platforms in the customer support category? To start, you can easily and clearly track all your software licenses and contracts. With the IT service catalog, you can streamline available fulfillment processes and service requests. The knowledge base helps you retain and share knowledge gained from resolved incidents. A key feature that differentiates this software is the risk detection capability using which you can continuously scan your software and hardware to detect inherent risks. The vendor offers mobile access and you can work on your account remotely using your tablet or smartphone. Plus, you can extend the software’s capabilities with smooth integrations with popular third-party apps like Zendesk, Google Apps and more. The Active Directory enables you to keep your Windows open to manage users in the organization. An outstanding aspect is the easy customization with which you can create custom fields, forms, and reports that work for you. The CMDB helps you to keep track of configuration items in your infrastructure. Finally, you can use the benchmarking tool to measure your service performance in real-time and make improvements as required. If you want to learn more about the software you can check out our review of Samanage features or simply read on for a more detailed analysis. Why is the software so popular and what makes it stand out among the scores of apps in the market? Read on to learn about the app’s strong points which make it a high-quality platform that can serve the entire customer support needs of small and large organizations. Samanage follows the Information Technology Infrastructure Library (ITIL) regulations, which means it provides all the critical features essential for the service support needs of large IT operations. These include standard ticketing, and change, incident, and problem management. The software can be used to streamline your company’s service requests and delivery flows as it provides all employees full visibility of their requests. Agents can easily raise tickets that contain all the relevant information. The main view indicates all ongoing, pending, and resolved incidents. It can be configured to show vital information such as due dates, sender, and receiver. The asset management functionality offers users a full look at the asset’s lifecycle from its purchase to disposal. You can view crucial data on the asset such as performance, location, and specs. If your organization is using a BYOD (bring your own device) policy, you can monitor the company’s mobile devices and laptops through Group Policy or Domain Login scripts. Routine tasks can be a drain on your IT support agents. You can create a self-service portal to offload routine tasks from IT support. Samanage offers this capability with full service catalog capabilities as it is ITIL-certified. The IT service catalog enables you to define and publish the offered support services on your site. The catalog also prevents nuisance requests from clogging your service channel. Your support agents can document common problems and best practices in the knowledge base. This can help to reduce their workload. The knowledge base is bolstered by a secure ITIL-compliant backend. Samanage’s Service-Level Agreements (SLA) promise the following services: deliverinf support commitments, setting service targets and alerts, tracking response time, and measuring performance. The SLA can be useful for regular security checkups. If you miss a task, a warning is sent to alert the IT support. Other key features of the Samanage SLA are: daily grading view, robust reports, setting of business hours, and problem management. If you need more details on Samanage pricing and features you can also read our detailed review of the software. The vendor provides excellent customer support. The agents are helpful and respond promptly. The system is very customizable which helps it do a lot more than the obvious tasks. There should be an option to automatically change a ticket’s status when an agent responds. Notifications could be more customizable. The groups and permissions settings can be simplified to make it easy for users. These are only a few negligible areas though, and the vendor is alreday working on fixing these minor issues. Our detailed analysis of Samanage pros and cons shows that the app is definitely one of the best customer support services on the market. This suite is scalable for the needs and growth of any company, and offers suitable pricing plans for both small and large enterprises. You can make use of the excellent free trial to test drive the system’s main features and understand how the app can help your company. Prospective users can easily register for Samanage free trial here.